Collegiate Members - Helping Hand Initiative - Sigma Nu Fraternity, Inc.
What can a fraternity do to benefit the community in which it is located? Simply put, get involved. So, how do we get involved? How do we determine which organizations to help? There are numerous community organizations that need the help of fraternities and sororities. From volunteer work to fundraising efforts, fraternity and sorority members bring added enthusiasm and exuberance needed by these organizations to fulfill their missions and efforts. Sigma Nu Fraternity has established the Helping Hand Initiative in an effort to collectively draw its members toward servant leadership and to understand the importance of making a positive impact within each members' local community. What is the Helping Hand Initiative? 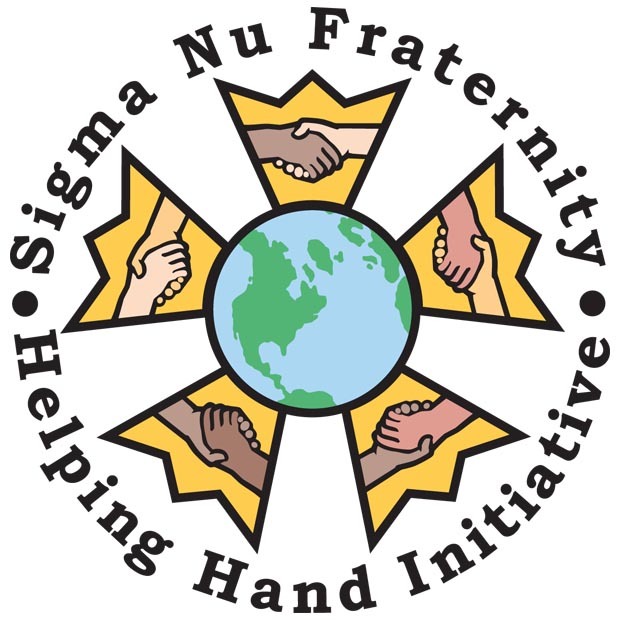 In 2004, at the 61st Grand Chapter, Sigma Nu Fraternity established the Helping Hand Initiative, the official philanthropic and service effort of Sigma Nu Fraternity. The Helping Hand Initiative (HHI) consists of two primary components: The Founders’ Month-of-Service and the Helping Hand Partners. April has been designated as The Founders’ Month-of-Service, signifying the birth date of founder Greenfield Quarles on April 1. The month has been established as a time for all Sigma Nu members to get involved either in their local communities or the global community at-large. A chapter can participate by hosting any event, regardless of the organization that it benefits. The Helping Hand Partners of the Initiative have experienced significant change since the Initiative's inception in 2004. Certain partnerships have come and gone based on the Fraternity’s strategic goals and the number of partnerships has diminished or increased depending on the desire of the General Fraternity. The intent of the partnerships, however, has remained constant. The Fraternity’s identified partnerships serve as an opportunity for chapters unfamiliar with service and philanthropy to identify organizations which their members feel most passionate and where the chapter can make the greatest impact to their community. The Strategic Plan of the General Fraternity calls for our fraternity to provide opportunities for members to become involved in community service and philanthropic endeavors to foster the development of service leaders. To that end, the Fraternity feels it is important to not limit the opportunities available to our members thus, we recognize and support our chapters’ choice of service activity or 501(c)3 organization. A chapter’s participation in the Helping Hand Initiative benefits not only the community, but chapter members as well. By participating in the Helping Hand Initiative, chapter members will build project management and communication skills and create numerous networking and leadership development opportunities. The collegiate chapters will also benefit by improving community relations, building a positive chapter image and furthering the brotherhood of the chapter. The Helping Hand Initiative exhibits a flexible, multi-faceted model of organizational interaction established to meet not only the needs of Sigma Nu chapters, but the needs of the community organization(s) with whom the chapters are working. The Helping Hand Initiative was NOT established to replace any community service or philanthropic traditions that may exist at any individual chapter. Rather, the Helping Hand Initiative was established as an official framework in which chapters can operate philanthropically. The Helping Hand Initiative was also established to promote the service and philanthropic efforts of the collegiate chapters and place Sigma Nu members, everywhere, in a position to realize the benefits and satisfaction of being a servant leader. How does a Chapter get involved? STEP 1 – Has your chapter identified a cause or organization it is passionate about supporting? If so, you are already participating in the Helping Hand Initiative. STEP 2 - Your next step is to determine the timing of your event(s) and how individual members will be able to participate. The Fraternity encourages its chapters build a long term relationship with their community partners and to provide monthly opportunities for members to be involved in the chapter's effort. If possible, we also encourage chapters to considering participating in the Founders' Month of Service. Regardless of when your event(s) takes place, it is important that you keep record of your participation and activities for your chapter and university records and for inclusion in the annual Pursuit of Excellence Self-Assessment. To track the chapter's efforts, feel free to utilize the Service and Philanthropy Tracking Sheet template. STEP 3 – Now it's time to have fun! The chapter has put in the hard work of planning and preparing for the event and now is the time to put that plan into action. Host the chapter's event(s) on the day(s) it is scheduled for and enjoy the camaraderie of the brothers and the people the chapter's efforts are benefiting. Once the event has concluded, be sure to send out press releases to local news affiliates and share your story with us at news@sigmanu.org! For assistance with composing a press release, check out the Generating Positive Press resource guide and don't hesitate to contact the General Fraternity for more information. Questions regarding the Helping Hand Initiative, the Founders' Month of Service, and the Fraternity's Helping Hand Partners can be directed to Christopher Brenton, Director of Chapter Services, at christopher.brenton@sigmanu.org or (540) 463-1869 Ext. 652.